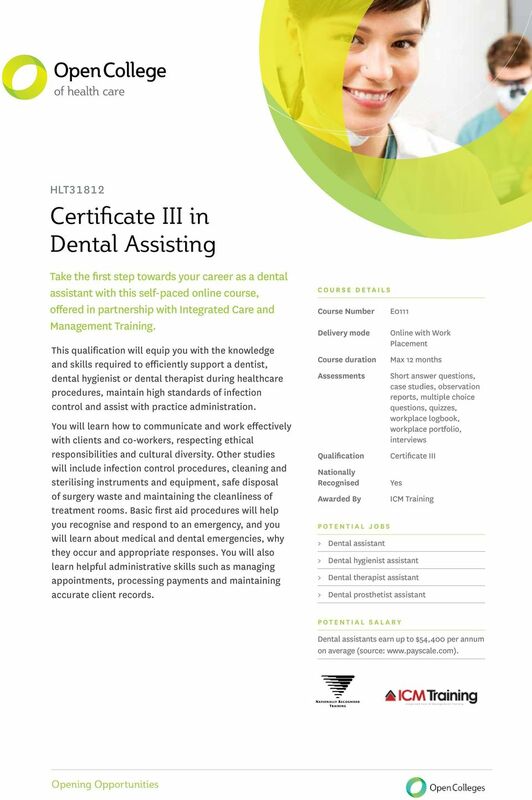 Download "Certificate III in Dental Assisting"
4 HLT31812 Certificate III in Dental Assisting What you need to know about this course COURSE NUMBER E0111 How is the course delivered? This is an online course with work placement. This means that you will complete your knowledge and initial skills development through online learning. You will also undertake a work placement. This will allow you to master practical skills and gain invaluable workplace experience and contacts. This qualification contains pre-requisite units, which have been embedded into the first part of this course. What is online learning? OpenSpace is Open Colleges online campus. Through OpenSpace you will: > Access your learning materials and assessments > Undertake and upload assessments > Engage and interact with your Course Coordinator, Trainer and Assessor > Participate in student forums and find a Study Buddy > Access your assessment grades and feedback > Access Student Support Services What learning materials are included with this course? Your learning materials are accessed through OpenSpace. These include; > Study Guide > Learner Workbooks > Additional readings and resources > Instructional videos > Weblinks to relevant articles, information sources and videos > Course discussion forum > News forum What is work placement? Work placement is a structured learning program undertaken in a workplace. It involves undertaking set tasks and activities over time under the guidance of a workplace superviser and Open Colleges Workplace Assessor. To be assessed in the workplace you will complete a logbook of workplace tasks, complete a workplace portfolio and undergo interviews with your Workplace Assessor. You may also be visited by an Open Colleges Workplace Assessor in the workplace. A work placement can be a highly stimulating and rewarding part of the course. It will enable you to participate in a real workplace and put into practice the new skills and knowledge that you are learning in the course. The work placement also provides Open Colleges with an opportunity to assess the skills and knowledge you have developed through the course in the workplace. This is called workplace assessment. Open Colleges provides you with a detailed Workplace Assessment Guide. This details the specific requirements of the workplace and workplace supervisor to meet the needs of the course. You are required to identify a suitable organisation for your work placement. However, Open Colleges can provide advice and direction through our Work Placement Support Team. Please note that you may need to undertake the work placement at more than one workplace in order to meet the requirements of the course, depending on the nature and scope of activities conducted at the workplace. 5 HLT31812 Certificate III in Dental Assisting Specific work placement requirements: > Duration: 120 hours (minimum) > Workplace: Registered dental services facility. Students will need access to specialist equipment and resources such as access to charts and records, dental equipment and instruments, rotary cutting instruments and dental materials. Complete details of the requirements of the workplace are available in the Workplace Assessment Guide. > Supervisor: The Workplace Supervisor will need to be an individual currently employed as a dental assistant in a relevant workplace with a Certificate III in Dental Assisting, or equivalent, and at least three years experience in this position. > Recommendation: Open Colleges recommends that you consider the work placement options in your local area prior to enrolling in this course. > Requirements: There are a number of statutory checks required by workplaces, such as a Criminal Record Check. These vary by state. In addition, individual workplaces may impose additional requirements on students undertaking work placement. You will be responsible for the costs of any such checks or requirements. The Open Colleges website has information on the individual statutory requirements for each state and territory. > Insurance: Open Colleges provides insurance cover for the mandatory work placement you undertake as part of your course. This insurance coverage includes Public and Products Liability Insurance as well as Student Personal Accident Insurance. > Questions? Contact our Course and Careers Advisers on to discuss any questions you might have regarding the work placement requirements of the course. How is the course assessed? During the course, you will undertake: > Short answer questions > Case studies > Observation reports > Multiple choice questions > Quizzes > Workplace Logbook > Workplace Portfolio > Interviews What about Recognition of Prior Learning (RPL)? We understand that you may already have many skills and areas of expertise that you have obtained in different ways and these are recognised through our Recognition of Prior Learning (RPL) process. 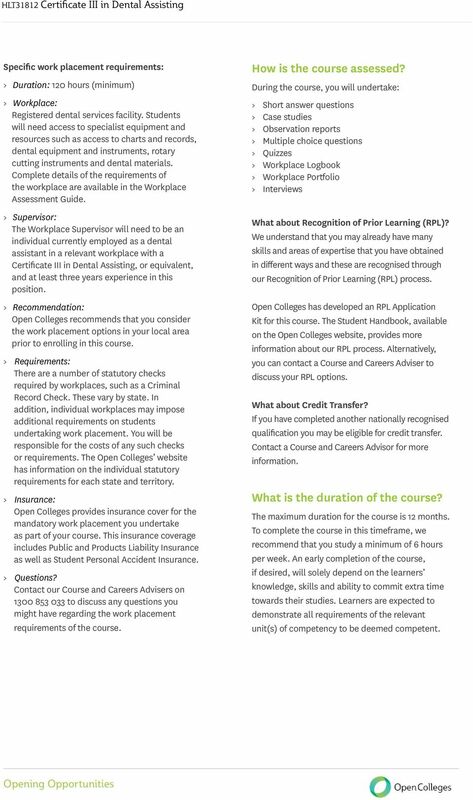 Open Colleges has developed an RPL Application Kit for this course. The Student Handbook, available on the Open Colleges website, provides more information about our RPL process. Alternatively, you can contact a Course and Careers Adviser to discuss your RPL options. What about Credit Transfer? If you have completed another nationally recognised qualification you may be eligible for credit transfer. Contact a Course and Careers Advisor for more information. What is the duration of the course? The maximum duration for the course is 12 months. To complete the course in this timeframe, we recommend that you study a minimum of 6 hours per week. An early completion of the course, if desired, will solely depend on the learners knowledge, skills and ability to commit extra time towards their studies. Learners are expected to demonstrate all requirements of the relevant unit(s) of competency to be deemed competent. 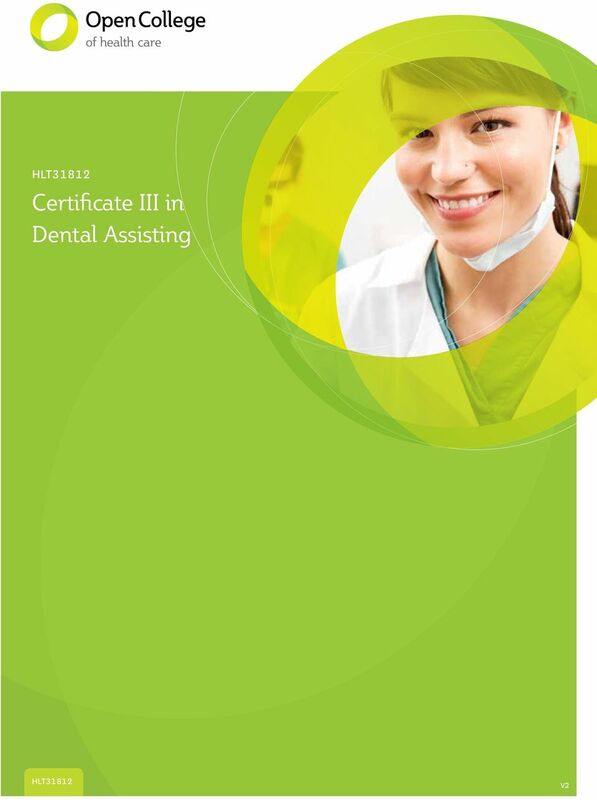 6 HLT31812 Certificate III in Dental Assisting Will I need to get my Senior First Aid Certificate? You will need to provide a certified and current Senior First Aid Certificate, Workplace Level 2 or Level 2 qualification from a Registered Training Organisation to demonstrate competency for HLTFA311A Apply first aid at your own cost. 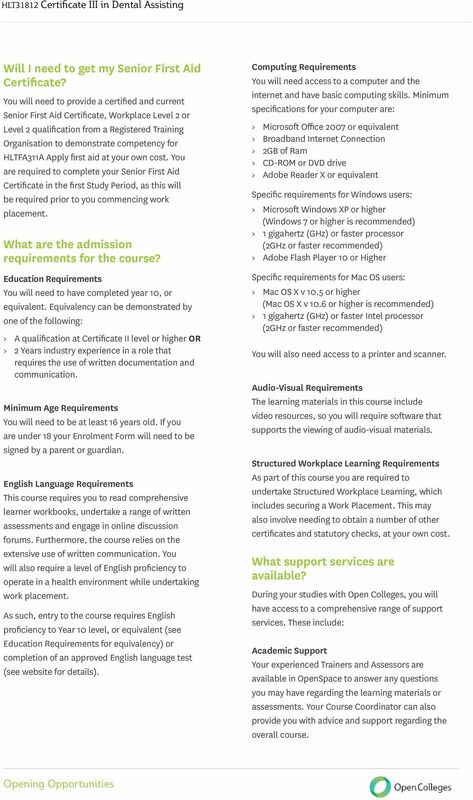 You are required to complete your Senior First Aid Certificate in the first Study Period, as this will be required prior to you commencing work placement. What are the admission requirements for the course? Education Requirements You will need to have completed year 10, or equivalent. Equivalency can be demonstrated by one of the following: > A qualification at Certificate II level or higher OR > 2 Years industry experience in a role that requires the use of written documentation and communication. Minimum Age Requirements You will need to be at least 16 years old. If you are under 18 your Enrolment Form will need to be signed by a parent or guardian. English Language Requirements This course requires you to read comprehensive learner workbooks, undertake a range of written assessments and engage in online discussion forums. Furthermore, the course relies on the extensive use of written communication. You will also require a level of English proficiency to operate in a health environment while undertaking work placement. As such, entry to the course requires English proficiency to Year 10 level, or equivalent (see Education Requirements for equivalency) or completion of an approved English language test (see website for details). Computing Requirements You will need access to a computer and the internet and have basic computing skills. Minimum specifications for your computer are: > Microsoft Office 2007 or equivalent > Broadband Internet Connection > 2GB of Ram > CD-ROM or DVD drive > Adobe Reader X or equivalent Specific requirements for Windows users: > Microsoft Windows XP or higher (Windows 7 or higher is recommended) > 1 gigahertz (GHz) or faster processor (2GHz or faster recommended) > Adobe Flash Player 10 or Higher Specific requirements for Mac OS users: > Mac OS X v 10.5 or higher (Mac OS X v 10.6 or higher is recommended) > 1 gigahertz (GHz) or faster Intel processor (2GHz or faster recommended) You will also need access to a printer and scanner. Audio-Visual Requirements The learning materials in this course include video resources, so you will require software that supports the viewing of audio-visual materials. Structured Workplace Learning Requirements As part of this course you are required to undertake Structured Workplace Learning, which includes securing a Work Placement. This may also involve needing to obtain a number of other certificates and statutory checks, at your own cost. What support services are available? During your studies with Open Colleges, you will have access to a comprehensive range of support services. These include: Academic Support Your experienced Trainers and Assessors are available in OpenSpace to answer any questions you may have regarding the learning materials or assessments. Your Course Coordinator can also provide you with advice and support regarding the overall course. 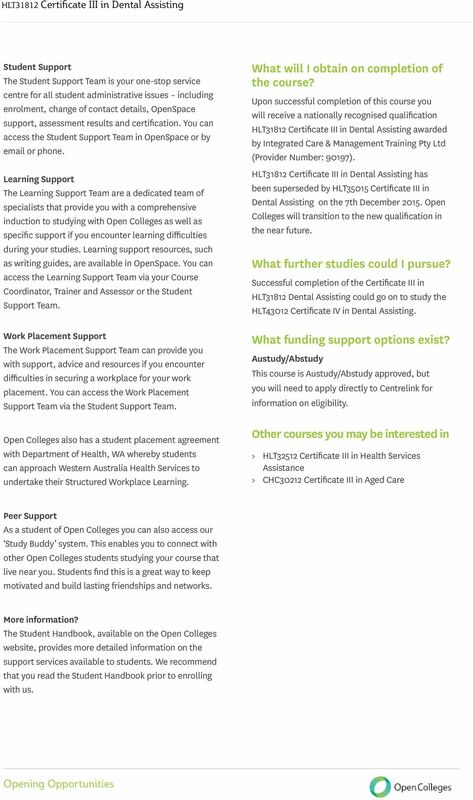 7 HLT31812 Certificate III in Dental Assisting Student Support The Student Support Team is your one-stop service centre for all student administrative issues including enrolment, change of contact details, OpenSpace support, assessment results and certification. You can access the Student Support Team in OpenSpace or by or phone. Learning Support The Learning Support Team are a dedicated team of specialists that provide you with a comprehensive induction to studying with Open Colleges as well as specific support if you encounter learning difficulties during your studies. Learning support resources, such as writing guides, are available in OpenSpace. You can access the Learning Support Team via your Course Coordinator, Trainer and Assessor or the Student Support Team. Work Placement Support The Work Placement Support Team can provide you with support, advice and resources if you encounter difficulties in securing a workplace for your work placement. You can access the Work Placement Support Team via the Student Support Team. 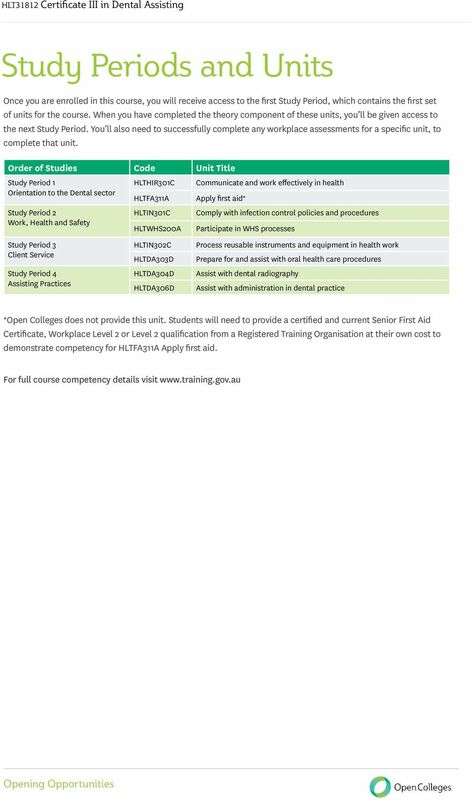 Open Colleges also has a student placement agreement with Department of Health, WA whereby students can approach Western Australia Health Services to undertake their Structured Workplace Learning. What will I obtain on completion of the course? Upon successful completion of this course you will receive a nationally recognised qualification HLT31812 Certificate III in Dental Assisting awarded by Integrated Care & Management Training Pty Ltd (Provider Number: 90197). HLT31812 Certificate III in Dental Assisting has been superseded by HLT35015 Certificate III in Dental Assisting on the 7th December Open Colleges will transition to the new qualification in the near future. What further studies could I pursue? Successful completion of the Certificate III in HLT31812 Dental Assisting could go on to study the HLT43012 Certificate IV in Dental Assisting. What funding support options exist? Austudy/Abstudy This course is Austudy/Abstudy approved, but you will need to apply directly to Centrelink for information on eligibility. Other courses you may be interested in > HLT32512 Certificate III in Health Services Assistance > CHC30212 Certificate III in Aged Care Peer Support As a student of Open Colleges you can also access our Study Buddy system. This enables you to connect with other Open Colleges students studying your course that live near you. Students find this is a great way to keep motivated and build lasting friendships and networks. More information? The Student Handbook, available on the Open Colleges website, provides more detailed information on the support services available to students. We recommend that you read the Student Handbook prior to enrolling with us. 10 Studying with Open Colleges Open Colleges provides you with the freedom to study where and when you want. We understand that our students are constantly juggling multiple priorities, so our unique learning approach has been specifically designed to enable you to fit education and training around your lifestyle. After you enrol with Open Colleges you will be provided with access to OpenSpace our virtual campus. Here are some of the key features and benefits of OpenSpace: Access Access your learning materials, assessments, videos and additional online resources wherever you have an internet connection. You can also download your study guides, workbooks and assessments so that you can study wherever and whenever it suits you. Support Access the student support team using the online enquiry feature. OpenSpace also provides a detailed searchable database of over 400 Frequently Asked Questions, so that we can provide you with 24/7 responses to many of the common queries. You can also contact the student support team by phone on To make your learning experience as easy as possible, we will send you a copy of your textbook. I thoroughly enjoyed the course, which I did online, and I appreciated the feedback I received from my trainer, as well as the ongoing support provided by Open Colleges. John Layton, Open Colleges Student 2013 Connections Connect with your trainers, assessors and other students. You can participate in the lively student forums, link up with a study buddy or engage with your trainer and assessor. OpenSpace is also where you will submit your assessments and receive your grades. Knowledge OpenSpace is your link to Gale our extensive online library. Through Gale you will have access to millions of academic, magazine and newspaper articles from around the world. 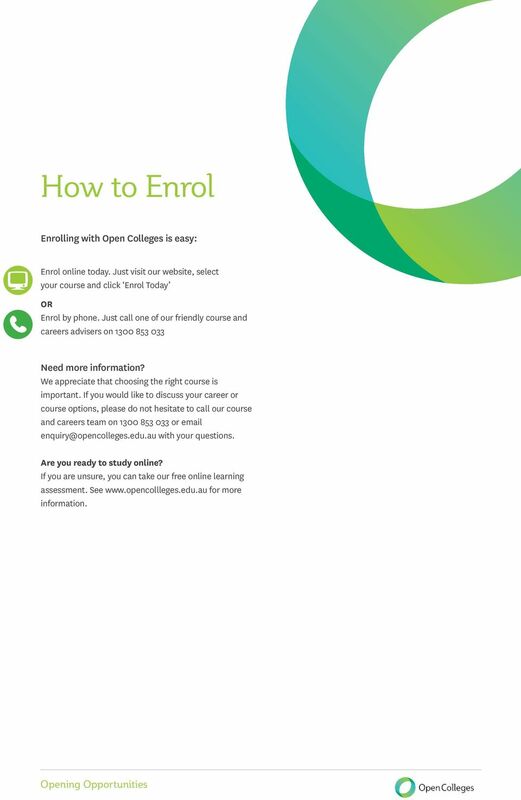 11 How to Enrol Enrolling with Open Colleges is easy: Enrol online today. Just visit our website, select your course and click Enrol Today OR Enrol by phone. Just call one of our friendly course and careers advisers on Need more information? We appreciate that choosing the right course is important. If you would like to discuss your career or course options, please do not hesitate to call our course and careers team on or with your questions. Are you ready to study online? If you are unsure, you can take our free online learning assessment. See for more information. 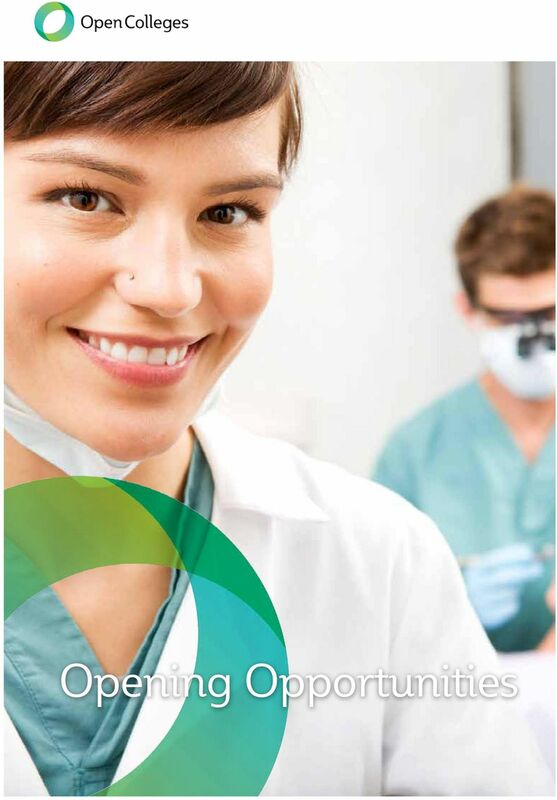 Career Information HLT31812 Certificate III in Dental Assisting ENROL NOW! A rewarding career with pathways for advancement The national Dental Assistant training specialist and membership organisation.